Most Canadians say they probably won't try cannabis and if they already use it won't use more when the mood-altering drug, according to a survey published Thursday. 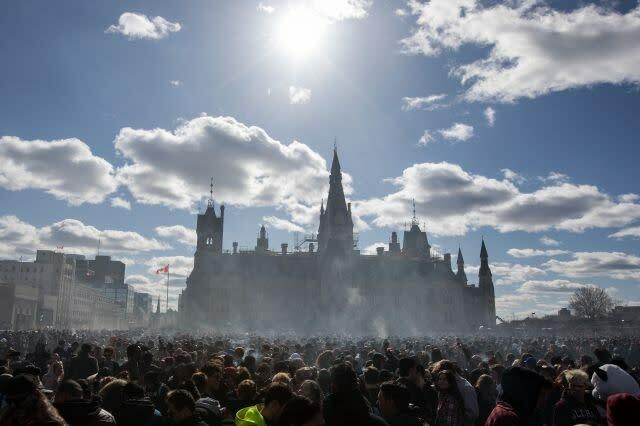 Canada is set to become the first G7 nation to legalize the recreational use of cannabis on October 17. In anticipation, the government statistical agency has been collecting data on pot trends to help policymakers better understand the social and economic impact. According to the latest Statistics Canada survey, 82 percent of more than 5,000 Canadians asked said they would be "unlikely to try cannabis or to increase their consumption with legalization." Among current users, 28 percent said they would probably boost their pot use. "Intention to use cannabis in the future and once legal largely depended on whether the person reported current use," the agency said in a statement. About 4.6 million Canadians or 16 percent of the population used cannabis in the first half of this year, according to the data. Males were more likely to consume pot than females, and appeared to prefer dried flower and leaf, whereas females liked edibles better. Overall, dried cannabis accounted for 86 percent of total consumption while edibles -- which will only become legal in 2019 -- accounted for 32 percent. Other popular pot products included hashish and kief, liquid concentrates and vape pens. One quarter of users reported spending up to Can$100 (US$77) on pot from May to June; 21 percent spent up to Can$250 and 21 percent spent more than Can$250. The rest, who claimed to have tried it only once or twice in the period, spent nothing on pot.